Efficacy of Medicinal Plants, The Cinnamon. Cinnamon bark contains essential oils to 4% with sinamaldehid main content of 60-80%. Other components sinamil acetate, eugenol, b-kariofilen, linalool, cineol, coumarin. Other content prosianidin, mucilage polysaccharides, cinnamic acid and phenolic acids. LD50 of cinnamon oil 4.16 g / KgBW and 3.4 ml / kg bw. In sub-chronic toxicity test with a concentration of 1% in the feed rats causes a slight enlargement of the liver cells. At a dose of 0.25% does not cause unwanted effects. No cause mutagenic effects. 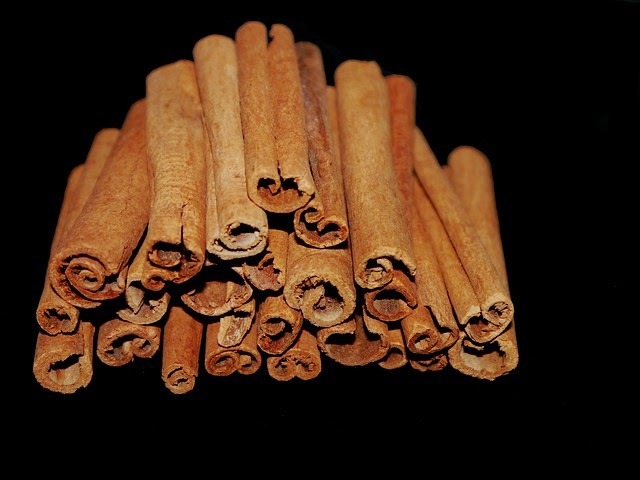 Methanol extract of cinnamon no teratogenic effects in rats. Cinnamon bark extract can reduce levels of glucose in a glucose tolerance test. Hypoglycemic effect presumably through increased secretion of insulin. B1yang sinamitanin compound isolated from cinnamon bark showed antihyperglycemic effect on 3T3-L1 cells. Combination sinamitanin B1 and insulin can increase the uptake of methanol glukosa.ekstrak cinnamon leaves at doses of 100, 150, and 200 mg / KgBW can significantly lower blood sugar levels in mice induced by alloxan. Essential oils have a carminative effect, lowering the tracheal smooth muscle contraction and guinea pig ileum, colon and stomach are also dogs. Antispasmodic activity is sinamaldehid content. Mechanism of action: hydroksikalkon content serves as insulin in adipose cells 3T3-LI. Sinamaldehid an aldose reductase inhibitor strong against, carbohydrate metabolism enzyme that converts glucose to form alcohol, sorbitol, using NADPH as a reductant. Water extract significantly lowered absorption of alanine, an amino acid that is important for gluconeogenesis from rat intestine. In vitro studies using cell membrane adiposity and in vivo in animals showed the effects of insulin sensitization. Giving cinnamon 1, 3 or 6 g / day in every day for 40 days lowered fasting glucose levels 18-29%. Clinical trial in 60 patients with diabetes mellitus or cinnamon placebo dose (1 g, 3 g, or 6g) / day for 40 days. In group 1 g of cinnamon fasting blood sugar dropped 2.9 mmol / L; in groups of 3 g / day decreased 2.0 mmol / L; and the group of 6 g / day decreased 3.8 mmol / L.
The essential oil of cinnamon has anti-bacterial properties and anti-fungal in vitro on Escherichia coli, Bacillus subtilis, Salmonella typhimurium, Staphylococcus aureus and Pseudomonas aeruginosa (24). Fungi: Aspergillus spp., Geotrichum candidum, Cladosporium werneckii, Candida lipolytica, Kloeckera apivulata and C. albicans. Contraindications: Allergic to cinnamon and sinamaldehid. Unexplained fever, pregnancy, lactation, peptic and duodenal ulcers. Vitro extract 2 g / 100 ml tetracycline HCl lowers dissolution so that only 20% who live after 30 minutes compared to 97% in the water. Incompatible with Halloysitum rubrum. Daily Dose: dried bark from 1.5 to 4 g made infusion, 0.5 to 1.0 ml of the liquid extract alcohol 70% (1: 1), tinktura 2-4 ml, extract: 2-4 g / day. Essential oils from 0.05 to 0.2 g / day. Notice; All info above from the official herbal plants research, Please do not using the method without herbalist expert advice.